I'm not up to much - the weather is rainy, the dog is still tired from his jail break on Friday and the garden doesn't need anything today. I'm feeling a bit blue - one of our hens died and Ron found her in the coop this morning. She was probably egg bound. 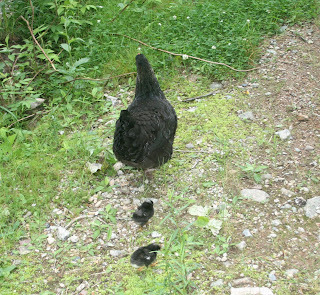 We really liked her - her name was Crow and she was last year's mama with her two offspring. I know it sounds crazy but they do all have their own personalities. Crow was very gentle and mild. 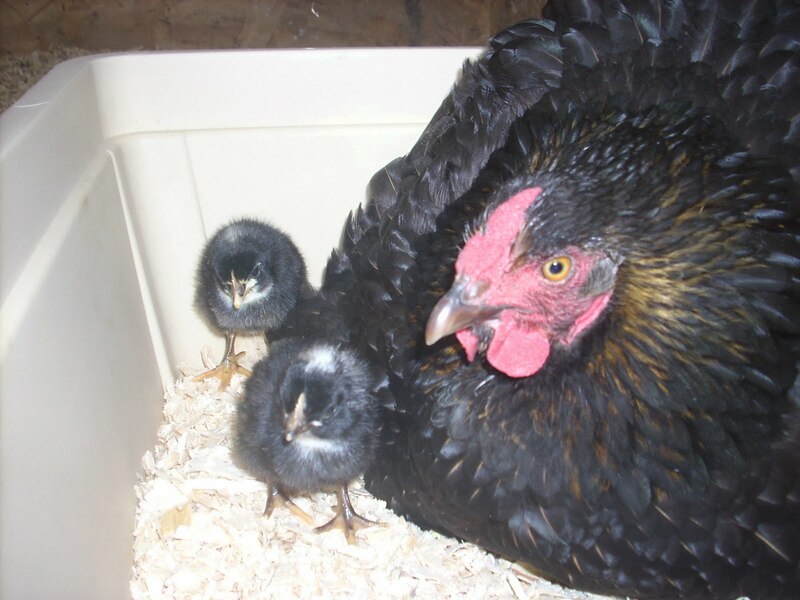 Dearie shone as a chick - she was always first and foremost to be interested, to be picked up - she's a very gorgeous lady - all speckled and so forth but perhaps a little pushier than Crow was. The two Rhode Island Reds - Bea and Ruby - are independent - they're the quickest to go off exploring and like many twins don't seem to have much use for the rest of the flock. They don't mind being petted or picked up either - very nice temperments. 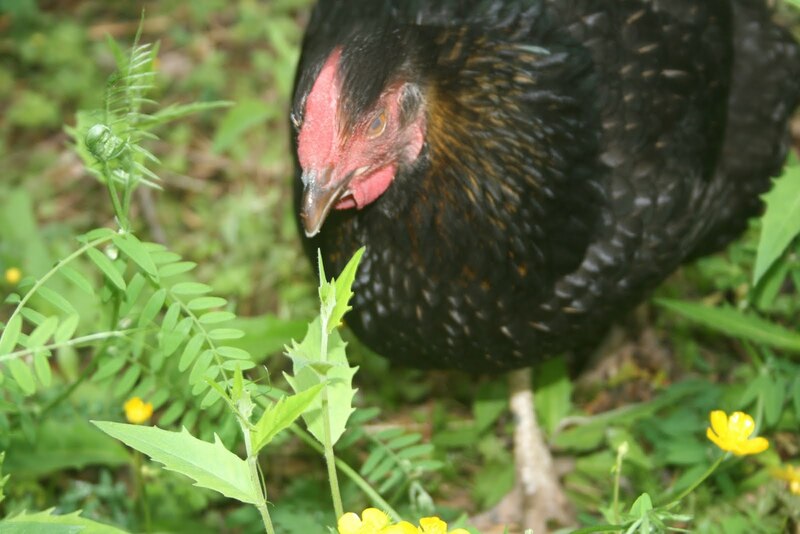 Sissy Miss Prissy, the youngest hen, is a bossy little piggy. She absolutely is the first one out of the coop, the first one to mosey up to the grub and she has no interest in being petted or picked up and will let you know by pecking you if you forget. Her brother is Jackmo, our resident rooster, is of course gallant and courageous and very pleasant unlike his mean daddy, John Wayne. This is our first death in the flock other than the culling of young cockerels and the execution of John Wayne for crimes too numerous to mention. Ron is really going to miss his favorite gal - he named her and doted on her. 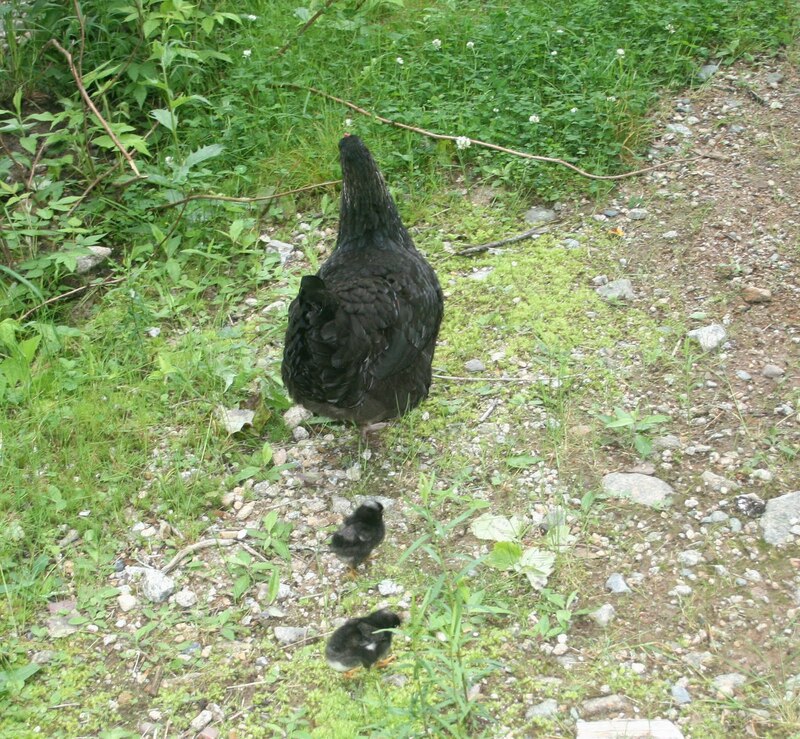 I'll post some pics of her from last year with her babies in tow. here she is with Sissy Miss Prissy and Jackmo, a fierce mama! on another note - I am going on a self-imposed retreat for two weeks - one for writing and one for my family road trip...I'll be back to post and visit in a fortnight and look forward to being refreshed and renewed and re - ady to go! thanks Liza - I just went into the coop and all of them were in their regular little spots on their roost making their nice murmery night noises but no Crow. Poor thing. So sorry for the loss of Crow... I am giggling though, about the execution of John Wayne--where do you get these names? Sad about Crow((((. Glad you are taking a vacation..enjoy yourself!!! I need to find out what egg bound means, but it does not sound good.